The first episode for the Simpsons was aired in the year 1989 and if my vague memories serve me well, that episode should be about how Bart nearly ruined Christmas when Marge spent the family�s Christmas gift money on removing Bart�s tattoo. (Ok, I was a toddler then and in actual fact, I got the information from the official website) Throughout these fourteen years, countless games have been produced based on the hit TV show, but none, in my personal opinion, did the TV show justice. That was until Vivendi Universal Games came along. Imagine putting the developers of Grand Theft Auto and the TV producers for the Simpson's together. The end result is the latest console game based on the Simpson's. 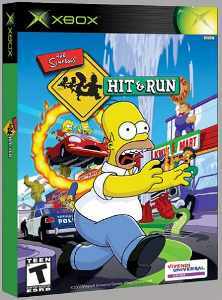 Simpson's: Hit and Run retains the gameplay of GTA but adds in elements from the hit TV series, resulting in a wacky, fun and non-linear game intended for all audiences. As the story goes, the citizens of Springfield are growing suspicious over the sudden appearance of mysterious black vans and videos cameras in the sleepy town of Springfield. To add spice to the storyline, there is also a New and Improved Buzz Cola that everyone is interested to know more about. That is not all. The story, according to Vivendi Universal Games, is actually penned by the writers of the hit TV show, which makes the game as close to the show as possible. Players are given the option to play the storyline game, look through their scrapbook or participate in bonus games. The scrapbook, in my opinion, is the feature that is going to make the game one of the most replayable games out on the market. It keeps tracks of the number of missions completed, the cards collected, the clothes bought, the races won, the number of vehicles unlocked amongst other statistics. Competitive players will never stop at the game until their scrapbooks show a perfect record. On the other hand, the bonus game will not be unlocked unless at least all the collector cards in a level of the game have been found. A mini-track will be unlocked for every unlocked level and players will have the chance to race against computer opponents, or go head-to-head with up to four friends in a multiplayer game. The game is simple. You run about, collecting items and completing missions. Each of the seven levels will contain seven primary missions. Bart and Homer will be the character you control for four missions out of seven, while Lisa, Marge and Apu will each have one, allowing for maximum character exposure. Players take turns playing as Homer, Bart, Mare, Lisa and Apu, taking them through different levels and mission throughout the game. The character list reads like a who-is-who of the Simpsons family, except for maybe Apu, who happens to be a resident in Springfield. Fans of the TV series will definitely recognize the various cars on display in the game. You have the family sedan, Bart�s Honor Roller, the Longhorn, the Canyonera, the Ferrini, the Malibu Stacy Car, and the 70�s Sports Car, amongst a total of over 40 of Springfield�s finest vehicles. Different cards of different speeds and handling characteristics, so it allows for a lot of experimenting and essentially loads of family fun. Phone booths are the best things you can find in town these days. Scattered throughout each of the levels, they allow you to restore the condition of your current vehicle and you can even switch to a different one. Your choice includes any of the cars you have used before or unlocked. Players also have the ability to purchase bonus vehicles throughout Springfield from characters with dollars signs on top of their heads. The controls are easy to master, allowing players to fully concentrate on the game. When you are without your car, you can jump using the A button and perform a double jump by pressing the button twice. The X button is the attack button and you can execute combo actions by jumping and hitting the attack button. When you are driving, you hit the B button to brake or reverse. The X button is used for emergency braking and you can simply exit or enter a car using the Y button. True to the Simpsons� wacky style, the game also allows for reckless driving. Every object or pedestrian (Yes, you can knock down pedestrians in the game!) a player hits will increase the red Hit and Run meter. A siren would ring and you have to hit and run should your meter gets too high and the police are dispatched to chase you. There are basically three types of driving missions. You will often have to chase, evade or damage other vehicles. In the first level, you have to take on the role of Homer as you try to race past the principal and get to school in time to hand Lisa her project, while making sure you avoid the principal. For damage missions, players have to inflict increasing damage on opponents until the damage meter fills up. Navigation is a little tricky and that is where my number one complain comes in. There is no map! There are arrows on the streets to guide players along as well as a navigation radar that is located at the bottom right hand corner to aid in the identification of items, characters and key geographical locations. But there is no Springfield map that would have made gameplay a lot easier. It would be a great help to every single player of the game, to say the very least. We have to bear in mind that the game is not a racing game. Thus, players do not have to be stuck in their cars throughout the game. You can opt to get out of your car and basically run around the whole town on your feet. Players are given the ability to jump, double-jump and even attack by kicking. There is also a special Stomp attack which can be executed by hitting the attack button while performing a double-jump. The fun starts rolling in when you realize you can kick passer-bys. Coins will appear scattered throughout the levels and as rewards for breaking certain objects. They can be used not only to purchase bonus cars but special character costumes as well. Costumes can be obtained inside landmarks such as the Simpsons� house and the Kwik-E-Mart. The special costumes is simply of the best features of the same. Some costumes are required during part of the game while others are simply for the fun of it all. The different costumes are directly linked to past episodes of the cartoon, including everyone�s favorite � Homer�s Muumuu. Seven collector cards of items from various episodes of the show can be found on each level. Since there are seven levels, there will be a total of forty-nine collector cards hidden throughout the game. After collecting all seven cards in a level, you will get to unlock a track in the Bonus game. Gags can be found throughout the game. For instance, by walking into the Kwik-E-Mart, you would get to see the familiar Jaspes, encased within the cold freezer. By pressing the action button, you would be able to talk to him and he would produce one of those one-liners that fans of the show would be familiar with. Springfield is as detailed as you can get in a game. The suburban area, the downtown area and the harbor area of Springfield each has their own separate identity. Each area is designed to mimic whatever fans of the TV show has known throughout the years. There is the Burns� mansion, the Power plant, the Simpsons� house as well as the Kwik-E-Mart. The solid gold house, the gigantic Donut statue as well as the monorail station are also locales that can be found in the game. The characters look distinct and well animated. In other words, you would not have trouble differentiating between Homer from the rest of the Simpson's family. Turning 2d characters into 3d models is not easy but the developers deserve a pat for an excellent job well done. The single most amazing thing about this game is the voice-acting. On first playing, I thought that the voices sounded way too similar to the original cast. That was before I found out that the show�s primary casts actually reprised their roles for the game. One-liners from Homer and Bart sound great and extremely hilarious at times. The music for the game was extracted from the show as well. Each character has a unique soundtrack. In other words, went you play as Bart, you will hear a distinct soundtrack and when you play Lisa, you will hear a different soundtrack. Trust the developers to think of such minute details. It has always been hard to adapt a cartoon, especially a long running one such as the Simpson's simply because of its fame, its familiar cast and storyline, its existing fan base and the linear mode that most gameplay possess these days. But the developers of the game, High Voltage in this case, have done a really good job by borrowing Grand Theft Auto�s gameplay, its non-linear style of playing and at the same time, adding in a set fun and wacky ideas with constant references to the TV series. Now players will have the chance to play with their favorite characters from the hit TV series without suffering any of the indignity that other forms of gameplay may have otherwise resulted in. The end product is pure fun, fun that gamers used to derive from the GTA series without the violence and sexual content the game has always been known for. It is a new whole adventure you are getting yourself into when you play the game, an experience which the whole family can enjoy at the same time. It may be silly at times, especially in the eyes of adults who think they have long grown past that stage where they can still behave like silly kids, but sometimes, it is a relieve to go back to your childhood ways, to play in ways you would never have done in the shoes of an adult. For that, it should not be known as a good Simpson's game. In my opinion, it should be known as the best Simpson's game, ever!